A sidewalk shed is a temporary structure that is required to be installed on sidewalks near a building under construction to protect pedestrians from falling debris. They are often required by local codes. TSC Southeast installs sidewalk sheds in accordance with regulations to improve the safety of your work site and comply with building codes. Entrance Canopies are temporary structures that are designed to protect people who are entering a building from having construction debris fall on their head. At TSC Southeast, we design and install entrance canopies for construction sites that will prevent injuries on the jobsite. Before a sidewalk shed or entrance canopy can be erected on the jobsite, a permit has to be obtained, approving the design of the structure. TSC Southeast can help prepare the plans and drawings necessary to get a permit for sidewalk sheds, making the construction process smoother and easier. 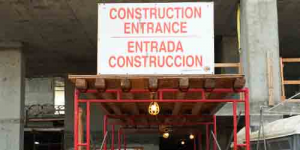 On the jobsite, certain signage is required for entrance canopies and sidewalk sheds. We provide construction safety signage to work sites. You must have proper signage on your site to be in compliance with OSHA standards and local codes. We provide South Florida construction sites with safety solutions, including sidewalk sheds and entrance canopies. To learn more about the products and services we provide, contact us today.